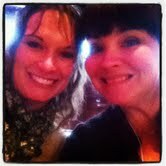 my writer friend Amelia Rhodes and me. A struggling playwright, I was constantly in collaboration with directors, actors, production staff. A small group of Church-people, they loved me, supported me, encouraged me. A few times, telling me when I’d gone a little too far in pushing an envelope here or there. They cheered and gave hugs and high-fives when I had my first publishing success. The church hired a new minister. He wasn’t supportive of the drama program. I got a job. Had a few more babies. Life happened and my writing paused. I started writing a secret novel. Ducked out of work early to write at a local coffee house. Terrified that someone would find out what I was doing. The writing was lonely. I didn’t know what I was doing. Had no mentors or cheerleaders. All my doing, the hermit-like-nature of my writing. I teetered on the edge of depression and anxiety (not to mention my work and church life “turned”). What I needed was community. I “came out”, telling my family and friends that I had a novel in the works. Met writer friends (the lovely Amelia Rhodes was my first reader). Started a critique group (I promise, these groups make you a better writer). Found a group of mentors at Novel Matters. Connected to other writers at The Festival of Faith and Writing and The Breathe Conference (you should come to Breathe…you really should). My writing family has calmed me when I’ve freaked out over an unkind word. Told me to “keep at it” when I got rejection letters. Screamed when I got “THE” email. Writers need people. Not just people. But relationships. But not only writers. Every person needs that bolstering, cheering, loving, convicting circle of people. We are not meant to be alone. Relationships make us who we are. Without them, we flounder. Without them, we stagnate, unable to truly grow. Tell me, who encourages you? Who prods you to look into the dreams you have and convinces you that they are worth trying? Who are your cheerleaders? So thankful for friends like you! I know I am not a writer, but I am one of your biggest cheerleaders! (And I will build you a fire to keep you warm while writing). Thanks for making my life so wonderfully beautiful! Love you so much! I am so thankful for friends like you, Susie! I know I am not a writer, but I am one of your biggest cheerleaders! (PLUS, I will build you a fire and serve you coffee while you are writing) Thanks for making my life so wonderfully beautiful! Love you so much! You totally ARE one of my cheerleaders! That’s for sure! I love you too! It’s funny you ask this question because the answer is my sister Heather, my best friend Megan my husband (who is really hoping I become his sugar mama) and You Susie Finkbeiner. You have made me feel like more of a writer and less of a poser then any one. Thank you my dear, thank you so much. Oh, my lovely, Jessie! You are a support to me in so many ways. And I’m so glad that you feel more like a writer…because that’s one of the things you are. You are a dear and valuable friend to me! You are Susie. You are. I don’t have eloquent words, just the humble statement that my life is so much richer knowing you! Kathi, you are beyond amazing. Thank you. My life is full of smiles because of your friendship. Can’t wait to see that t-shirt! So fun! Hi, Susie! Nice little post about community! I’ve also found my community of writing group friends to be invaluable. They keep me inspired! I’m going to link to this from the Schmexas Facebook page. Elizabeth! Hello! Thanks for stopping by. Yes, a writing group is amazing. Do you find that they really keep you motivated, too? Thanks for the Schmexas link! My wife is, hands down, my number-one fan, cheerleader, encourager, and lifter-of-spirits. She alone knows when I need a dose of reality to stem an unwarranted ego trip; she alone knows when I’m feeling all hollow inside and need some filling. She keeps me humble, but she doesn’t allow me to despair. She’s my rock. Yes, Rob, that wife of yours is pretty incredible. May I borrow her sometime soon? I miss her bunches. Um. Yeah. Totally. Meeting you pushed me over the writer’s ledge and into the abyss of the wonderful unknown adventure ahead. So glad you’ve been with me to break my fall…er… 🙂 Cheering you on!! Thanks for the mutual cheerleading friendship!